I know that I’m supposed to tell you something that will provoke you into thinking differently about Christianity. But the truth is I’d much rather you thought less about Christianity and more about living. That’s why this little talk was advertised under the title “Beyond Dogma”. You see I happen to believe that there is so much more to life than Christianity. But what do I know really. After all I’m always getting things wrong, especially when it comes to Christianity. I mean ever since I was a kid, I’ve been getting Christianity wrong. I just didn’t get it. I remember the first so-called “Christian” event I ever went to I must have been five or six years old. It wasn’t church or Sunday School. No the first “Christian” thing I ever went to was a funeral. It was amazing. I’d never been inside a church before. And the first time I saw that guy hanging up there in his underwear, I had absolutely no idea who he was or how he got there. So, I asked my Dad and I simply couldn’t believe it when he told me it was Jesus. “He was nailed up there, a long time ago?” Dad answered. By this point all I wanted to do was to get out of there. I mean, the murdering so and so’s killed the baby Jesus.Nailed him up there on the cross so that he would die. And all because of something I’d done? It was awful? I remember watching the guy up at the front. I didn’t even want to ask why he was wearing a dress. And he kept doing this X (crossing himself) And when he did this X he kept mumbling something but I couldn’t figure out what he was saying. So, I spent the rest of the service waiting and watching for him to do this X and trying to figure out what he was saying when he did this X. Well it wasn’t until we got out to the grave-side where I could get closer to the action that I finally figured out what the guy in the frock was saying when he did this X “In the name of the father and of the son and into the hole he goes!! !” For months after that funeral I would do this X, cross myself and repeat the magic words: “In the name of the father and of the son and into the hole he goes!! !” Now for those of you who don’t recognize it, I stole that routine from the great Irish comedian Dave Allen. I hoped it would make you laugh. But I also hoped that it would help you to think how ridiculous Christianity can be. Most of us have been hanging around Christianity for so long that we can’t or won’t see the humour in it. But it’s not all funny or laughable. It’s full of tragedy as well. Last Sunday, in place of the regular reading, I decided that because it was so close to Remembrance Day we ought to include a story from Elie Wiesel’s book “Night”. For those of you who aren’t familiar with the book it is about Elie Wiesel’s childhood experiences in a Nazi concentration camp during the Second World War. It’s an absolutely horrendous book to read and the story I chose from Night is perhaps the most horrendous story in the whole book. It’s a tragic story of the horrors of human history. It was read without comment. On Monday morning, I was driving to Waterloo and two people were riding along with me who’d been in church the day before, so they’d heard the story. One of them, commented on how she agreed that it was a powerful story but she didn’t exactly like the conclusion that God was somehow up there on the gallows, suffering right along with those who were suffering. Her discomfort at the trite way in which the listener and indeed God is let off the hook with the idea that yes this is horrible, but not to worry because they weren’t alone up there on the gallows, God was with them in their suffering. As if that somehow makes it all ok. The only trouble is the story doesn’t say that. In fact, if you read the book, Eli Wiesel actually says that God did die in the camps. The problem for Christians, is we’ve heard too many other Christians re-interpret that story and cast God in the role of the One who suffers with us. But what if Wiesel is right? What if God is actually dead? 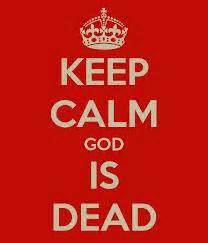 “My God, my God why have you forsaken me?” What if the whole point of Christianity is to say “God is dead”? What if we won’t ever really understand Jesus’ life, death, and resurrection until we understand that God is dead? For centuries now Christians have been telling the story of Jesus life, death and resurrection as if the whole point was so that Jesus could act as some sort of cosmic fire insurance. You know what I mean, Jesus died for your sins and you’d better believe it or you’re going to burn in hell for all eternity. Step right up folks get your insurance here come to church, pray every day, follow the rules and believe that Jesus died for you and presto, you’ll be saved from the fires of hell. No, no you say…that’s what the silly fundamentalists believe. That’s not true Christianity. We believe in a loving, gracious God who sees our suffering, and who loves us so much that he’s prepared to actually become one of us and suffer right along with us. And don’t worry about the fires of hell, because God’s grace is sufficient and we’re all going to heaven when we die. It will be marvellous, just you wait and see all you need is a little faith and all will be well. But what if the whole point of Jesus life, and death, are not about any of that? What if Jesus plaintiff cry from the cross is actually real? “My God, My God, Why have you forsaken me?” What if Wiesel is right? What if God is dead? What if that is the whole point of everything that Jesus tried to teach us. God is dead. Life is short. We’re all going to die. And when all is said and done this is all there is! So make the most of if folks. Eat, drink and be merry, for tomorrow you may die. What if the whole point of Christianity is to help us to experience the trauma of the death of God? What if the death of God is what it takes to set us free from all the idols we have come to worship? What if that thing that lies at the very heart of reality, that Mystery that is at the core of our consciousness, what if that wondrous Force that runs through all of Creation, what if that Being that lies beyond our ability to imagine, that thing that we call the Divine, is so much more than we can even begin to contemplate until the god that we have created for ourselves is dead? For only when we begin to realize that the god we thought was God is dead that we can begin to discover the God who is so much more than we dared to speculate. I’m only beginning to understand the death of God. I’m only beginning to see the teachings of Jesus in light of this new evolving way of understanding reality. I must confess that I suspect that most of the things I thought I knew about God, simply pale in comparison to the Mystery that I now suspect Jesus is pointing to. I’m beginning get an inkling of just what resurrection might be. I suspect that resurrection can only happen if there is something or someone to resurrect. And if God did and does die over and over again, then surely resurrection happens over and over again. If God is dead, then we will have to take full responsibility for our own existence. No pie in the sky escape routes. Maybe even nothing more beyond this life. And that’s ok. Because if this is all there is, then wow. Isn’t it wonderful? And if it’s not wonderful why isn’t it wonderful and what can we do to make it wonderful? Surely this is more than enough? And if it is not enough, how do we make it enough? Life becomes so much more precious when you can no longer expect a reward in heaven. If this is all there is then let’s get at it. I for one want to live fully because it’s in the living that I can learn about that thing that lies at the very heart of reality, that Mystery that is at the core of our consciousness, that wondrous Force that runs through all of Creation, that Being that lies beyond our ability to imagine, that thing that we call the Divine, that thing that is beyond the beyond and beyond that also, that thing we call God. And that’s what resurrection looks like to me. People loving God and loving one another, living fully, discovering, learning, experiencing it all and helping others to do the same. This is resurrection. This is what happens when we can finally see that God is dead. This is what I am beginning to see in the life, death and resurrection of Jesus. Resurrection is what Christianity is about! So, here’s to resurrection!!! Here’s to the source of our being, God who is beyond the beyond and beyond that also! Cheers!!! L’chaim! To life!!! This entry was posted in Adult Education, Evolutionary Christianity, PONDERING PASTOR, Progressive Theology and tagged Elie Wiesel Night, emerging church, evolutionary christianity, God is dead, progressive christianity, progressive theology, spirituality, theology by Rev. Dawn Hutchings. Bookmark the permalink. Read the entire post, because Pastor Dawn goes in a direction you don’t expect.